Howdy howdy! 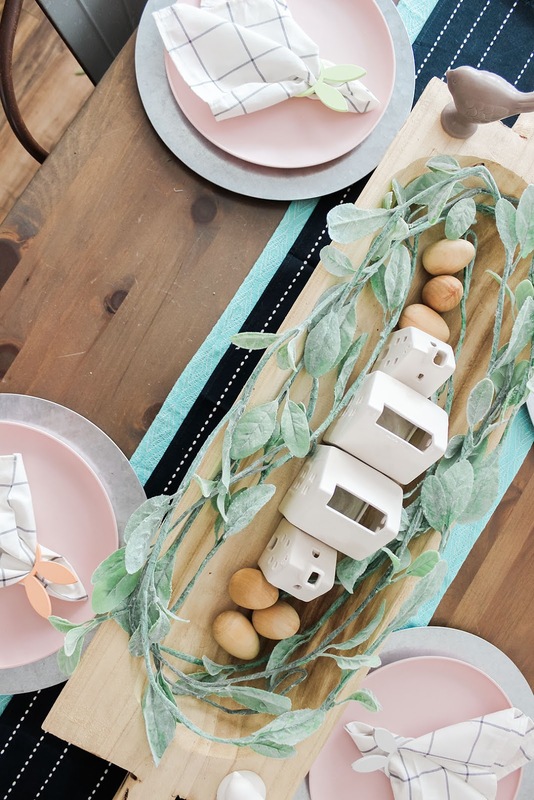 This warm weather we recently got has me bringing out allllll the spring decor now. My house is kind of in a weird limbo, decor-wise, once Christmas is over so I'm always excited to start decorating for another holiday and season. I normally wait until the first of whatever month Easter decides it wants to be in, y'know? 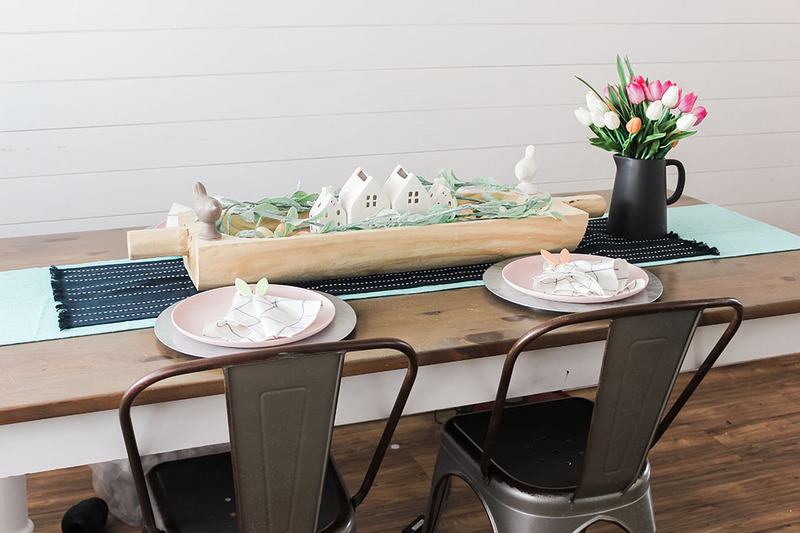 This week, I worked on my spring/Easter tablescape using a bunch of decor from Target's Dollar Spot along with a few pieces from them from last year! Nothing is over $5 and they have some really cute decor items that you can use over and over again. Okay, so be gentle. My tablescape could use some work but this is my first time ever doing one! 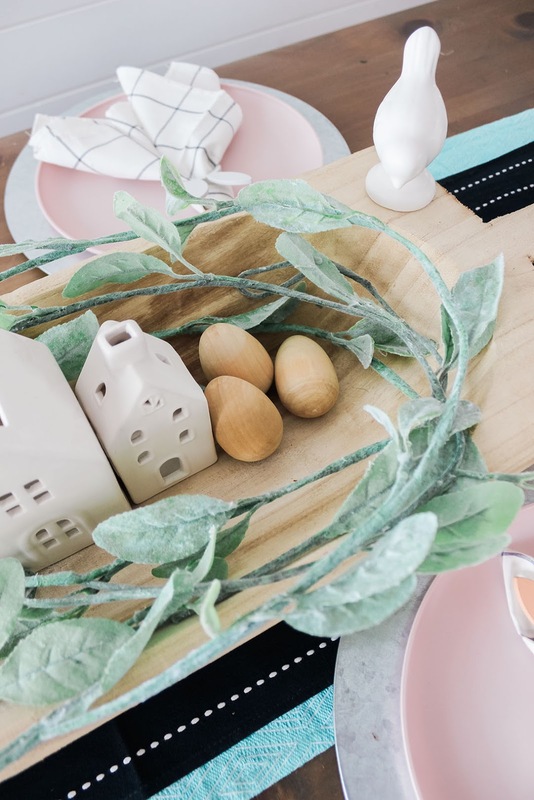 I know how frustrating it is to see a blogger share their home and fall in love with a cute piece of decor, just to find out it's $100+. I don't know about you guys but I can't afford that, even if I wanted to. I just wanted to show you guys that you can decorate without breaking the bank and that you can even re-use different pieces for different seasons (if you decorate that way). 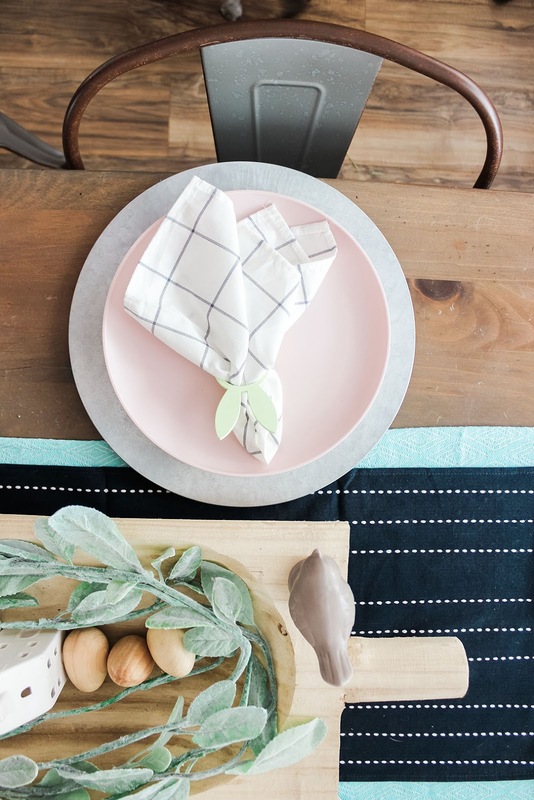 TABLE RUNNERS: The first thing I lay down on my table is the table runners. The turquoise one is super old, from TJ Maxx but I found this one ($14.99) that still gives you that fun pop of color. I also love this one ($12.49) and this one ($13.99)! I layered a navy blue runner ($3) from Target's Dollar Spot over the turquoise one. I wasn't sure I was going to like that look since the navy runner is significantly shorter but I think it ended up looking cute! DOUGH BOWL: The "centerpiece" on my table is this awesome dough bowl I scored from Target's Christmas clearance last year for $5! It's huge. I usually just keep it on my table and change out the decor inside. I found this ($39.99) but if you're looking for a deal on one, head over to Hobby Lobby (I can't find them online but I've seen a million in their stores) and use their 40% off any item coupon! For spring, I took some of Target's Dollar Spot lambs ear garland pieces ($5) and placed them inside the bowl. They're pretty long so you can get away with using just two but I snuck a third in there. DECOR: Inside the garland, I placed four of my Dollar Spot white houses from Christmas. 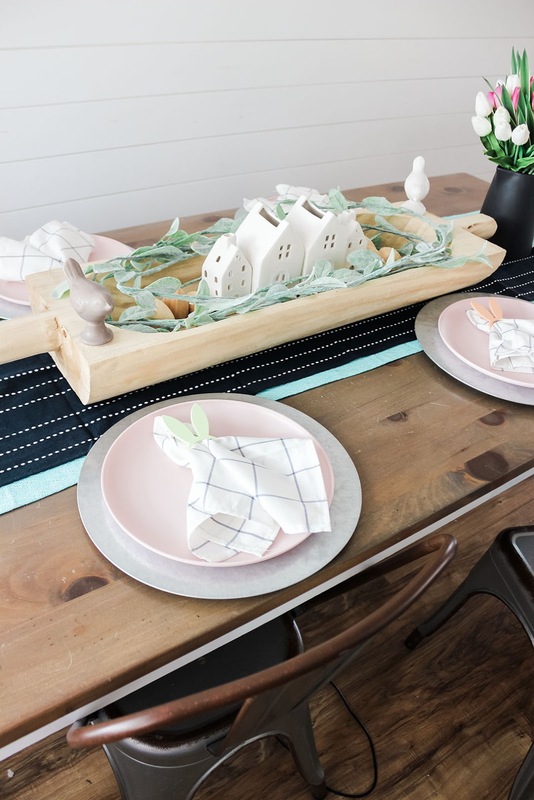 I don't think they're available any more BUT the Dollar Spot has the sweetest little white ceramic bunnies that would be perfect there instead. Our store doesn't seem to have them (like, WHYYYYY!?) but I know that they're out there! Snuggled next to the houses are some Dollar Spot wooden eggs ($3 for a 6 pack). NAPKINS: The napkins are from the Dollar Spot and were $3 for a pack of four. They have SO many cute neutral styles and whether they're just for looks *ahem* or you actually use them, it's a pretty dang good deal. 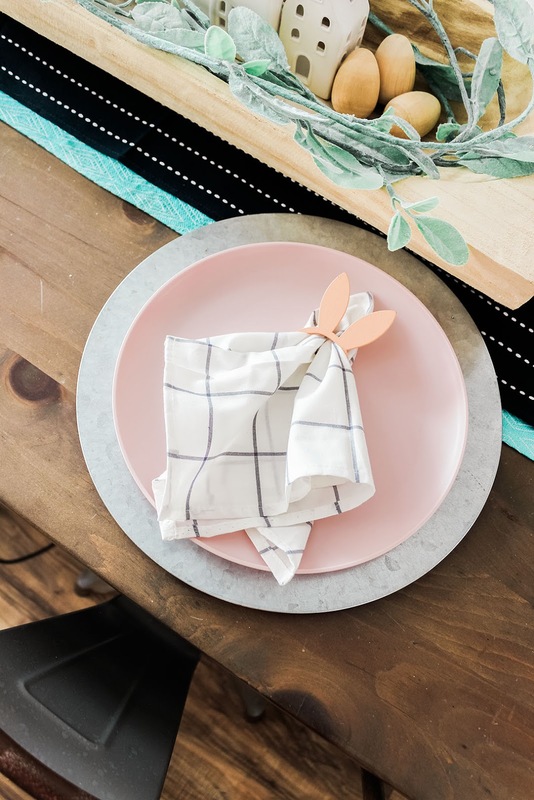 The bunny napkin rings are my favorite part! They're painted wood, come in a pack of 6 and are $3. They had a few other styles to choose from as well. FLORAL: I almost forgot about these guys. They look and feel so dang real. The white and pink tulips are from Amazon but the peach tulips are from the Dollar Spot and are $1 each. They're so cute and if you're only grabbing a few, they're worth it but if you're looking to grab a whole bouquet, you'll get a better deal from Amazon. The Target ones are shorter, "minis", if you will. Amazon's are longer and fit in a vase better. I bought a 10 pack for $8.99 BUT I found an even better deal here with 30 tulips for $15.99. Total steal! The vase is from the Dollar Spot last year BUT this year, they have the most gorgeous colored glass vases and decanters for $3-$5. Super gorgeous and springy! 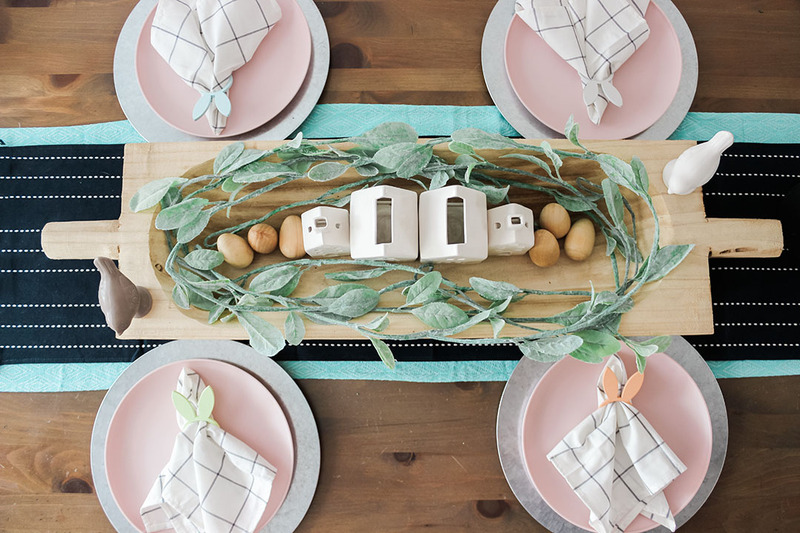 A super duper simple spring/Easter tablescape that you can grab most of the decor for under $5 each. 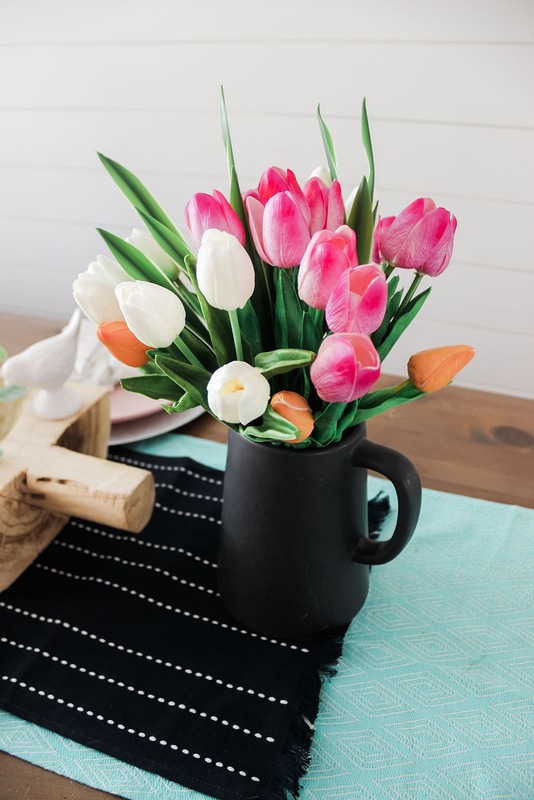 The Dollar Spot is filled with faux tulips, mini wheel barrows (super cute centerpiece idea! 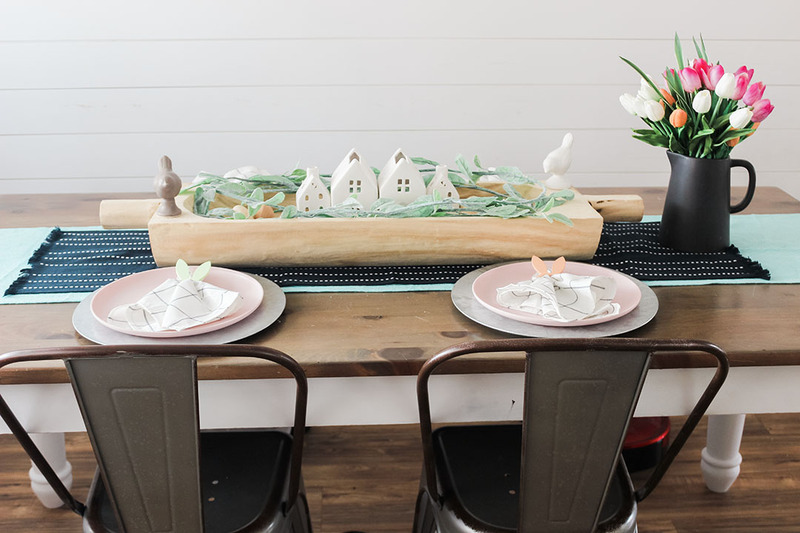 ), muddy boot flower holders, ceramic bunnies and a bunch of Easter decor. PSST. Don't forget all of this goes on sale after Easter so if you're looking to stock up, the day after is when it all goes down!